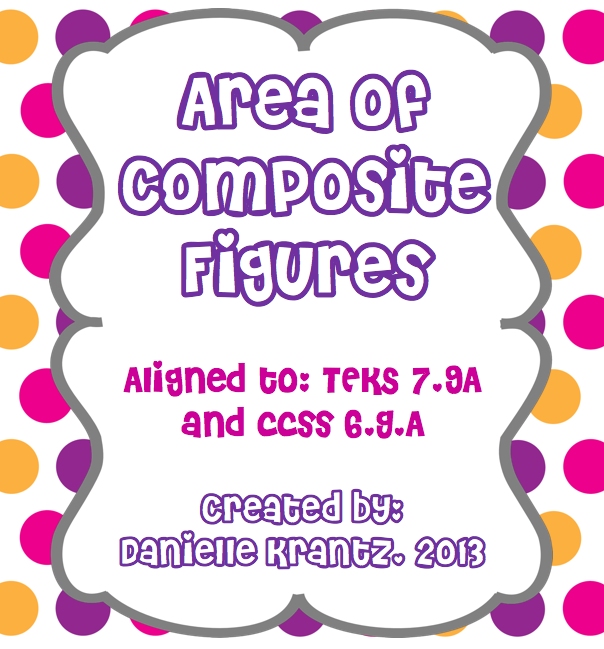 Excited to Make some Math Clipart! I finally had some time yesterday to work with the app iDraw for Mac. (Also available for iPad). The reviews of it are fabulous, but I am no artist that is for sure. I wanted something that would allow me to draw diagrams for my math worksheets. I have tried lots of different things including Math Illustrations which is just driving me crazy because I CANNOT figure it out. I think I need to play with it a lot, and with these three kids running around I can't sit and figure it out. 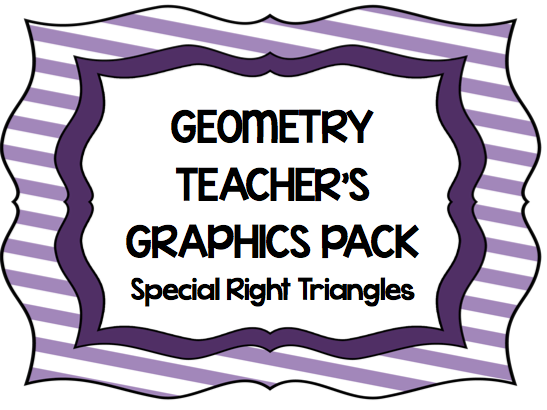 But anyway, I was able to figure out a little bit about iDraw yesterday, and I made my own pack of graphics for the Geometry teacher. 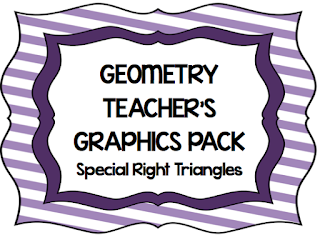 In this pack, there are 18 png files that are special right triangles (30-60-90 and 45-45-90.) The reason there are so many is because I rotated them in every possible direction and then labeled the angles. They can be resized as needed. Believe me, I know what a pain it is to draw all these from scratch, and then get the angles in the right spot. The best part of online blogging is meeting new friends. I have been reading many other math teacher's blogs and getting a ton of new ideas for the classroom. Today I want to introduce you to Danielle Krantz. She is the operator of the TPT store Live.Love.Math. I went to her store and I think she has a couple of unique ideas that I haven't seen before. 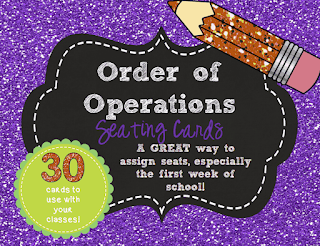 I especially like the idea of her Order of Operations Seating Cards that assigns students to their seat. 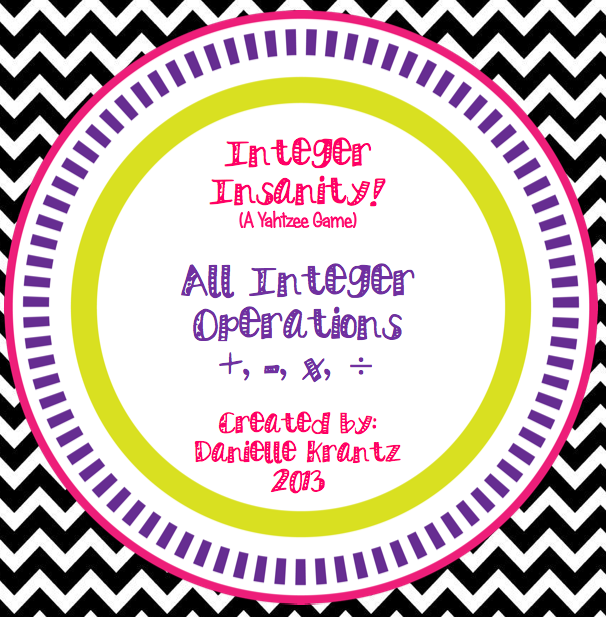 Check out her freebie - Integer Insanity. It is a game that looks a little bit like the Yahtzee game that I used to play when I was a kid. Kids often don't like worksheets - but a game that practice math - COOL! One of my favorite activities she has in her store are the station activities. 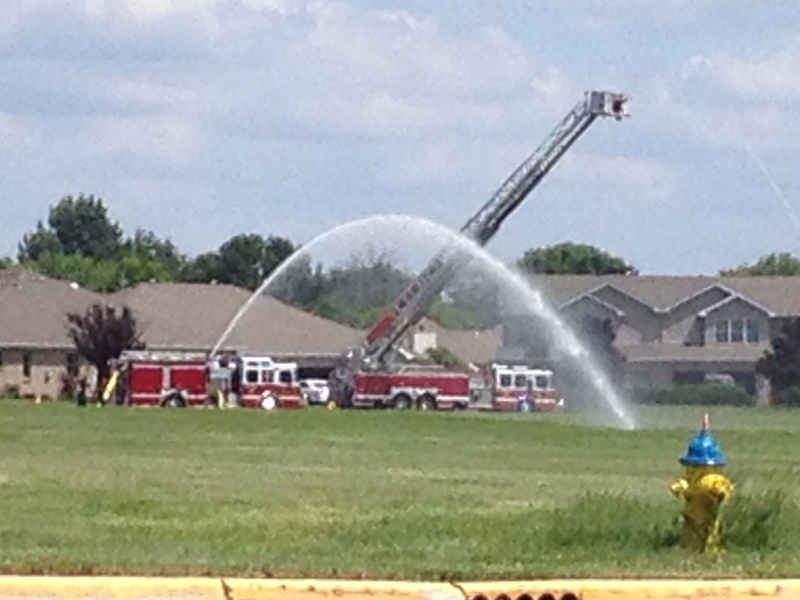 As a high school teacher, I haven't tried them before...45 minutes - I get 'em in and get 'em out! But there are days when we really need to move around, so I am definitely trying some of them this year. 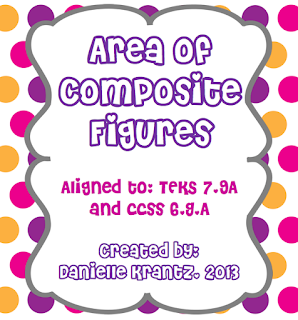 This particular one is on Area of Composite Figures. (Don't you love her covers - very eye-catching!) This activity has 5 stations and an exit ticket. One thing I really like about it is that it has a situation for each station - not just a boring looking problem. Easier to catch middle-schoolers attention that way! 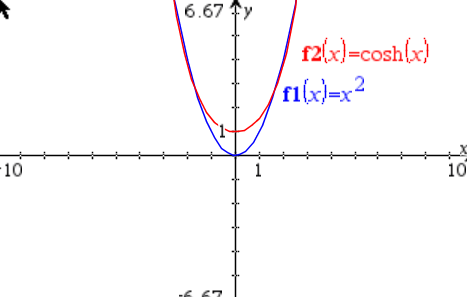 The Catenary Curve - Who Knew? 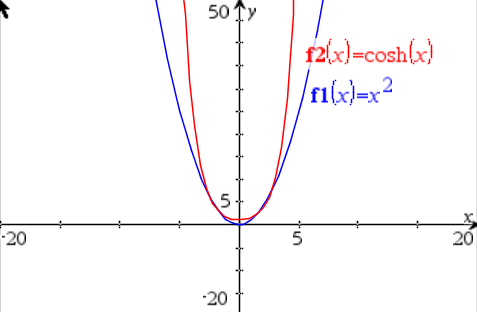 In the continuing spirit of finding real life examples of curves to talk about in class, today I am highlighting the catenary curve. 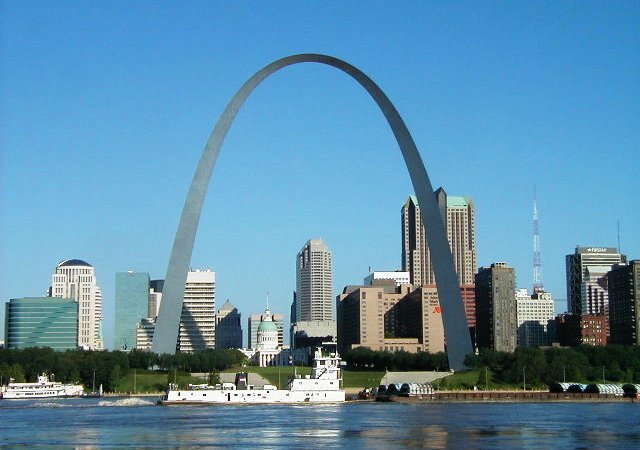 What is a catenary curve? 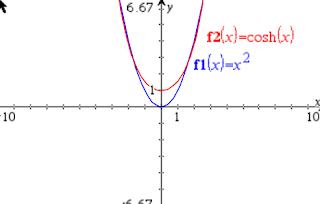 A catenary curve looks like a parabola, but it isn't! 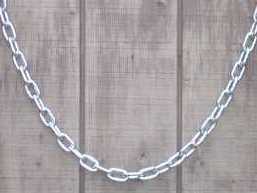 An example of a catenary curve is a hanging chain that is supported at both ends and is hanging under its own weight. 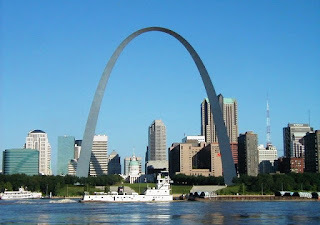 A great example of an approximate inverted catenary curve is the St. Louis Arch. Both the chain and the St. Louis arch actually look they could be parabolas, but let's examine the equations of these curves a little closer. 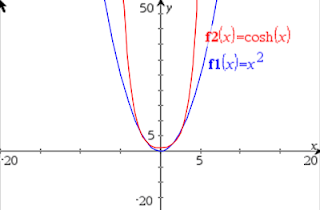 As you can see from this picture of the graph of a parabola and y = cosh(x), when you have a relatively small window, the parabola and hyperbolic cosine function look very similar. But, when you enlarge the window, or zoom out, you can see that the curves look very different. A great lesson for students that things are not always what they seem! I was excited yesterday when we were out running errands. I suddenly pulled over to the side of the road. My son, who always reads a book in the car, was surprised and asked what happened. I told him to look over to the side of the road and look for some math in action! What new item have you created lately? Let us know about it in this latest edition of Success in Secondary! My most recent item is another QR Code product, but this time it's FREE! Here is a screen shot of what the task cards look like. 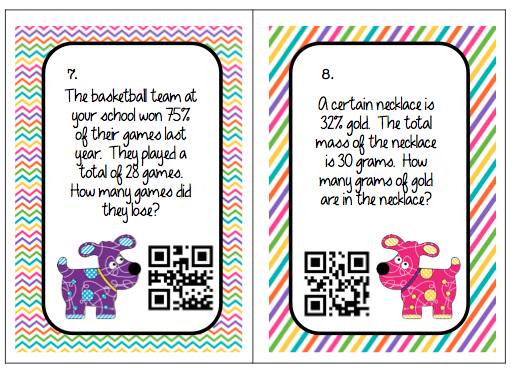 I was thinking about other ways to use all of the QR products that I have been making. 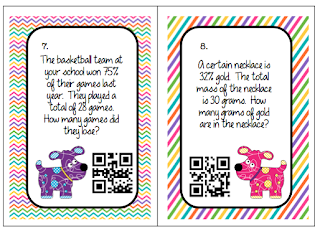 Besides using them in the classroom - in groups, as a center, or as a scavenger hunt - I also have been thinking about keeping each set of QR Code Task Cards in a packet. That way when a student is having difficulty with a particular topic, I can just send him or her home with the packet if they have access to a mobile device - instant extra practice! Even though it's time for summer vacation, there is no better time than the present to start planning fun new activities and lessons for next year. Check these out! Link up to 3 of your teachers pay teachers products. 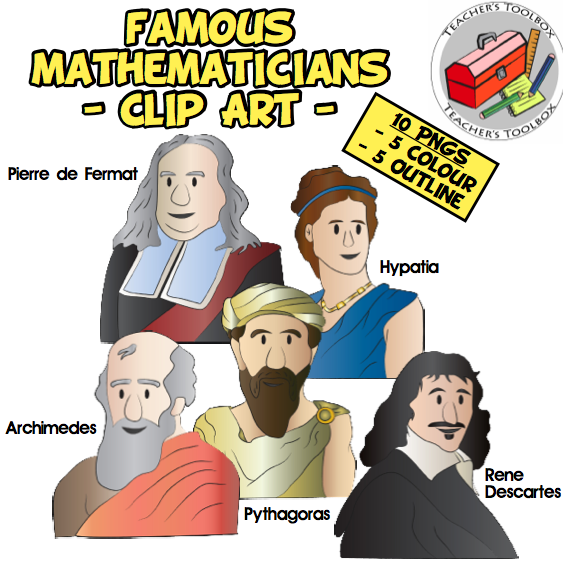 Love This Set of Mathematician Clipart! I have been thinking about incorporating more information about famous mathematicians in my classroom next year. Let me tell you, mathematicians have interesting stories to tell! I put a request on TPT for some mathematician clipart, and Teachers Toolbox really came through. Stacy really gave me exactly what I wanted! I just gave her the names of several mathematicians that I want to use and she made me both a color and black and white version. I really love these, and I appreciate the time and effort that went into them. Hop on over to her store and take a look at all the other things she has to offer, especially other Famous Americans, such as Alexander Graham Bell and Thomas Edison. It's the end of the school year, and although it is easy to look toward summer, who can resist a free math resource! 1) First up is a set of guided notes that will help students learn to solve one and two step equations. These notes are by Randi of 4 the Love of Math. She says: I give my students these guided notes one page at a time. Then, I post them on the smart board and we fill them out together. When we fill them out I have students read the notes out loud so that I can include literacy in my lesson. 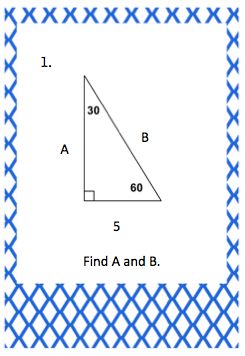 The students then have a resource to use when they complete assignments on solving equations. 2) Second, we have a set of notes by the fabulous Scipi. Math Study Tips You Won't Forget Who can resist - study tips you won't forget???? What a fabulous resource for students. Scipi says: Math courses are not like other courses. To pass most other subjects, a student must read, understand, and recall the subject matter. However, to pass math, an extra step is required: a student must use the information they have learned to solve math problems correctly. Special math study skills are needed to help the student learn more and to get better grades. This resource lists 20 math study skills intended to help students succeed in math. Use the resource as a journal topic, as a student guide, or copy it and make it into a poster. 3) Next up, we have an activity by Lindsey Perro. 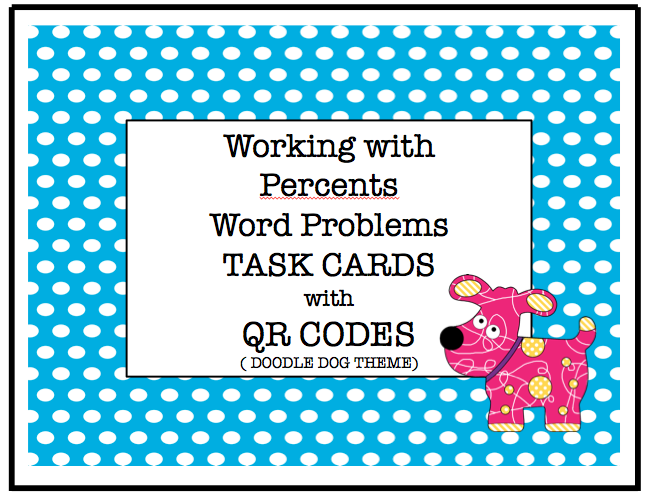 She has a lot of fun activities in her TPT store that help students practice math, but have fun at the same time. Her free activity is Equations of Lines in Color. This activity helps students practice changing equations into slope intercept form and then graph them. They graph each line in a different color - when they are done, they have a cool design. Easy to grade and fun for students - thumbs up! 5) The next activity is a freebie from Gina Wilson of All Things Algebra. In this Solving Equations Relay Race, students are divided into groups of 4. Person #1 solves the first equations and passes the paper to Person #2. Person #2 plugs the answer to #1 into their equation and solves - this continues until person #4 solves their problem. The first group to get 4 correct answers receives a free homework pass - Fun for sure! 6) The next idea is really fun. Showing your students a video to get them started learning something? A terrific way to show them real life applications as well. This particular video from Prep Toon shows students an introduction to ratio and proportion. 7) Here is a freebie from me, Teaching High School Math! It is a great one to start students off toward the beginning of algebra or at some time during Pre-Algebra. This is a Maze that students can use to practice solving one and two step equations. Students work their way from one side of the maze to another by solving one or two step equations. 8) The distance formula - it's something every student should know - many students can probably tell you what it is, but how many understand where it comes from? Peter Jonnard has a freebie that is all set up to help your students discover the distance formula - a real time saver! 9) I really like games for Algebra One. Since some kids end up taking Algebra at least a couple of times (Pre-Algebra, eighth grade, freshmen year...) it is great to have things that can teach them and entertain them at the same time. 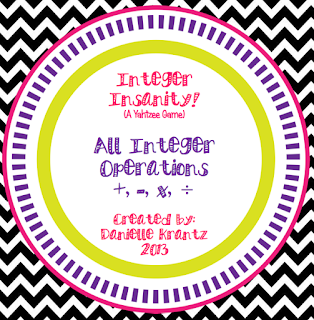 I really like Integer Insanity from Danielle Krantz. This is a game that is played like the game Yahtzee. I am definitely going to try this out. 10) It seems as if everyone is talking about Interactive Notebooks. 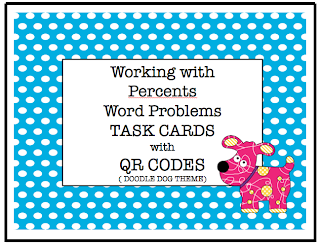 Here is a freebie from 4mulafun that will help you plan your interactive notebook. There is also a video on the product page that will help explain the interactive notebook and show it in use. 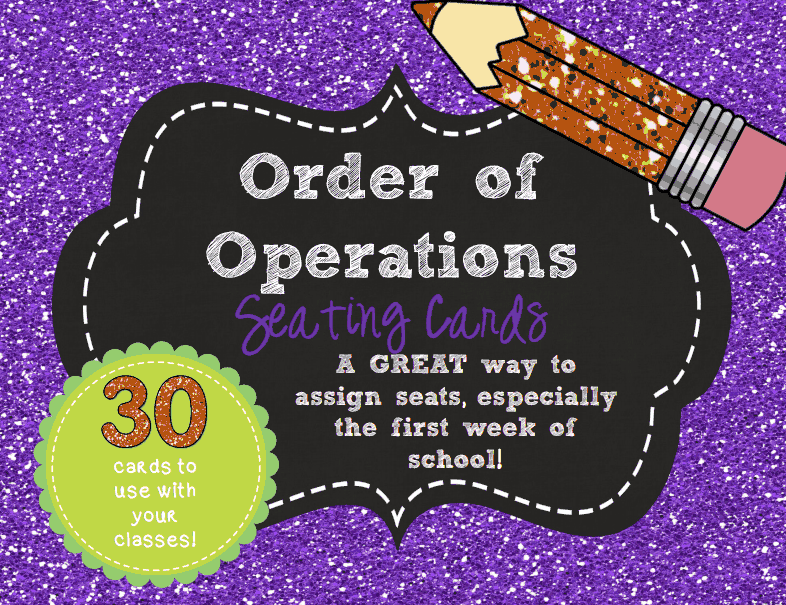 I hope you might consider using some of these activities next year in your classroom!